Vibing like Austin did a decade ago, San Antonio hasn’t reached peak hipness, but it’s close. Admittedly, it’s getting much of Austin’s creative spillover, but this Texan city is all about preserving its culture, not shoving it over for the next big thing. Celebrating its 300th anniversary in 2018, this is a big year for San Antonio, enhanced by the recent UNESCO City of Gastronomy designation. Progressive, yet mindful of its Southern Texas history, San Antonio is less than a three-hour drive from Houston. Here are five (well, maybe six) experiences not to miss. Recently expanded from 3 to 15 miles, take a stroll along the River Walk’s flagstone paths – a UNESCO protected site. Dotted with stone footbridges and anchored by lofty cypresses, it’s a refreshing spot to soak up the local atmosphere. And just like the Vegas strip, its licensed. Gain an even different perspective of the San Antonio River by taking a river taxi or boat cruise. Like the Calgary Stampede (minus the rodeo), Fiesta is a community celebration that draws a large crowd from around the world. What began in 1891 as a parade to honor the heroes of the Alamo has evolved into one of North America’s most famous festivals. Celebrating the city’s rich and diverse cultures, Fiesta (as the name suggests) is one large party. There are many events that comprise Fiesta. 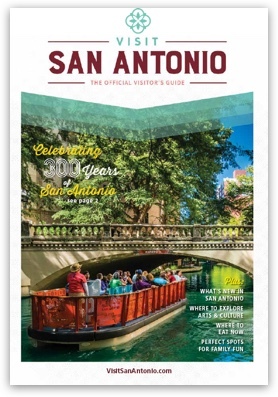 Most notably, there’s NIOSA (Night out in old San Antonio), the Texas Cavaliers River Parade and coronation events. No doubt you’ll have a Cascarones cracked over your head at some point. Over 53,000 empty eggshells are filled with confetti to get everyone in the festive spirit. This year’s Fiesta takes place April 19-29, 2018. There are four Spanish Colonial Missions included in San Antonio Missions National Historical Park. Along with The Alamo, they’re designated UNESCO World Heritage Sites. All five missions (The Alamo is one of them) are within seven miles of each other and are worth visiting. In fact, the River Walk expansion takes you directly to the southern missions of Concepción, San José, San Juan, and Espada. Known as the Queen of the Missions, Mission San Jose y San Miguel de Aguayo is by far the largest, residing on a five-acre compound. One of the best examples of baroque rococo architecture in the New World, the limestone stucco structures were designed by the Spanish, but built by the Coahuiltecan tribe and completed in 1782. With a goal of creating a self-sufficient community, the stone compound once supported a community of 300. In addition to admiring the impressive church with its flying buttresses and famed rose window, take a moment to wander through the tiny homes indigenous families built into the mission’s exterior wall – which was originally constructed to protect inhabitants from raiding Apache. Home to the Culinary Institute of America (yes, you can take classes! ), this mixed-use neighborhood ticks all the right boxes. It’s got live music every Thursday night, a weekend farmer’s market, indy boutiques and loads of trendy bars and restaurants. Bookmark Bakery Lorraine, for French-style patisseries and gourmet sandwiches. Fun fact: the chef/owners met while working for Thomas Keller at Bouchon Bakery. Anchoring the district is Hotel Emma, an opulent Victorian property that was formerly the Pearl Brewery. This recent restoration managed to preserve the brewery without feeling industrial, with layers of history and rich detail woven throughout the hotel. It’s a brew aficionados dream come true, but if you can’t spend the night, at least pop into Sternwirth tavern to throw back a pint inside an upcycled brewery tank. This 10-acre campus has almost as much going on outside as it does in, with a climbing wall and outdoor obstacles for kids. Outside for adults, there are period buildings to wander through and several spots beside the river to grab a quiet moment. The focus is on nature, science, culture, and it’s all very immersive with interactive displays. Those traveling with tots won’t want to miss the Body Adventure Gallery nor the Dino Gallery. Displaying only dinosaurs who once roamed through Texas, you can size your foot up against the massive Jurassic footprints uncovered in creek beds. Or, suss out the many immerse experiences in the Dino Lab. With its close proximity to downtown, you really can’t forget about The Alamo, now can you? This Spanish Mission still bears the scars of its famous 1836 battle with bullet pockmarks clearly visible on its exterior walls. Back then, Texas was part of Mexico, but American settlers wanted their independence. These Texans occupied and used Mission San Antonio de Valero (The Alamo) as a fortress during the 13-day siege. If you were ever going to pony up for a group tour, this would be the place. Air Canada offers direct flights to San Antonio from Toronto. Both WestJet and Air Canada offer direct flights to Houston from several Canadian cities.